ASUS has launched Its ROG Gaming Phone.It has a 6-inch AMOLED display fully supports HDR for that true blacks and vibrant colors when playing or simple video playback. Not only that, it also has a refresh rate of 90Hz and response time of 1ms. dual front-firing speakers which have copper accents. There are also ultrasonic sensors on the sides which acts as shoulder buttons. Powered by Snapdragon 845 processor with 8GB of memory and up to 512GB of storage. At the back, it has a distinctive ROG design complete with an RGB-enabled logo. The logo can shift colors just like a colorful gaming keyboard. On Camera, it has a 12-megapixel + 8-megapixel dual rear camera and an 8-megapixel selfie camera. Sensors Include accelerometer, ambient light sensor, compass, gyroscope, proximity sensor, and ultrasonic AirTrigger sensors. Packed with a 4000mAh battery that promises 7 hours of Wi-Fi gameplay. The company claims that the battery is capable of getting to 60 percent of charge in 33 minutes. The Phone measures 158.8x76.2x8.6mm and weighs 200 grams. 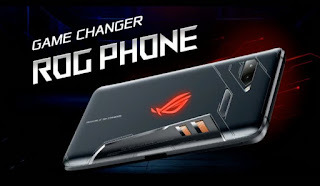 ROG Phone (being a gaming smartphone) has side mounted connectors which you can use with accessories such as the AeroActive Cooler. It attaches to the phone and gives an additional headphone port and a USB-C to allow you to play without obstructions. There’s also a Mobile Desktop Dock, the WiGig Dock by Gamevice, and the TwinView Dock. ASUS ROG Phone comes in Black color and is priced at Rs. 69,999 for 8GB RAM and 128GB and will be available exclusively from Flipkart. It is offering 12 months no cost EMI, Flipkart complete mobile protection worth Rs. 5999 at Rs. 999, 4GB data per day and cashback worth Rs. 5400 for Jio users.